that aim to introduce you to different aspects of Cyber Security. Defend several office buildings against a cyber attack. Solve the cipher related Xmas crossword. Complete a series of cyber security related tasks in this Cyber City. Resolve security issues on a simulated desktop computer environment. Run a simulated demonstration of three types of malware. In this game you learn about various types of networks, their advantages and disadvantages, and create network diagrams. In this activity you will learn how a simple firewall operates, taking on the role of a firewall, inspecting network traffic and deciding what should be allowed or denied. In this game you will need to use a simple substitution cipher to determine the question behind the coded information and provide an answer. This game emulates the process of using a piece of software called Volatility to analyse a memory dump and find evidence of malware. A timed wordsearch containing various cyber security terms. A timed crossword made up of several cyber security terms. 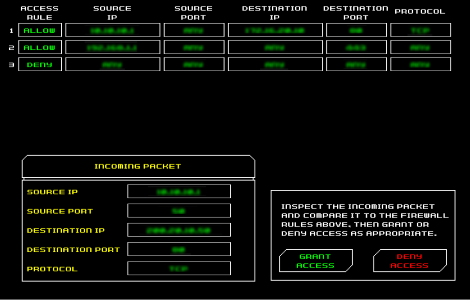 This game teaches about network ports and port numbers, and asks the player to filter packets to the correct applications. This game describes how password strength is measured by automated web forms and how to make a strong password. Solve a series of challenges based around codebreaking, set in the historic Bletchley Park. Try our tough Cipher Challenge now! 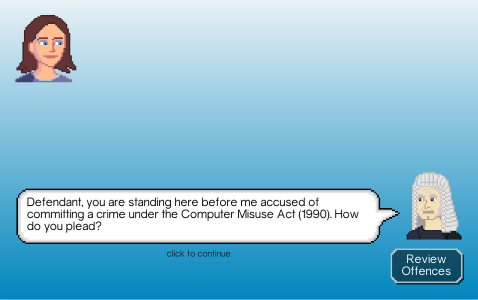 Solve the mystery of a data leak at a technology company with the help of various staff members.